In Part 1, I covered the problems of obtaining a sufficiently accurate temperature reading due to the high level of temperature variation across a tire tread. In this part I will cover a comparison of the temperature readings of a TPMS sensor hat mounts inside the tire air chamber with an IR gun and a tire temperature probe as used by a tire manufacturer in professional level tire racing. Again this will be more technical than some may want to read so the summary is that. 1. 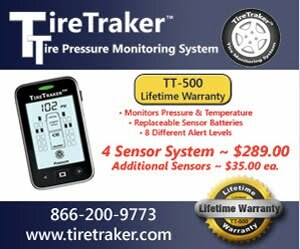 The TPMS provides a lower average temperature than seen in the tire hot spot. 2. The IR gun and race tire probe give similar readings but the IR gun gives lower temperature readings than the probe. 3. None of the gauges provided a reading that identified the tire that was 10 psi (15%) low. This confirms that you cannot use a temperature gauge to set the proper inflation for your street tires. The set-up: My normal cold inflation is 70.0 psi in my LT235/85R16 LR-E tires on my Class-C RV. I have had my unit weighed and know the actual corner weights. According to my loads and my placard, my minimum cold inflation should be 55 psi. I set one tire 10.0 psi lower than the other six tires. The test - It was cold (49°F) the morning I drove 13.5 miles (8 on Interstate at 60 mph) to meet with the manager of race tire development for one of the major tire companies. We then drove 1.3 mi on city streets to the interstate followed by 5.9 miles at 65 mph. We stopped and recorded the temperatures of all six tires in less than 30 seconds of stopping. It was the RF that was 10psi low. Conclusions: For normal tread depth street tires you cannot use tire temperature to set your tire pressure for if you try to set pressure so all tires read the same temperature you may be off by 20% or more from what is needed based on your load. The internal air temperature as read by a TPMS is cooler than the hot spot of a tire. The surface temperature as read by the IR gun will be lower than the probe which is closer to the hottest spot on a tire. Bottom line: IR guns are OK for conductive metal parts such as hubs and brakes but are not sufficiently accurate for items with large temperature variation over small distances. Probes will give a more accurate reading than a surface reading. To get the actual hottest temperature a probe needs to be able to reach the edge of a tire belt. "you cannot use tire temperature to set your tire pressure"
I'm sorry, but who EVER thought of setting tire pressure by temperature instead of pressure? Nobody that I've ever known or heard of. Pressure gauges are how you set pressure, by any rational standard. You seem to be dragging a big red herring here. According to your data, it appears to me that you had both front tires under-inflated. They are both running hotter than the other 4 rear tires. IR temp guns should never be used to calibrate anything especially air pressure of tires. The only device to use for setting air pressures in your tires is a good digital air pressure gauge like the Accutire MS-5515B Truck and RV Digital Tire Gauge with LED Light and Bleed Button which I had purchased from Amazon.com. IR guns should ONLY be used to look for major differences in tire temps then look for the reason why such as pointed out by the data above showing two tires that were under-inflated versus the other four. Race car crews use tire temperature to fine tune the tire pressures all the time, and I have used tire temperatures as a crude indicator of whether I have the pressures in the ball park or whether I might have a leak that results in one tire getting hotter than another. I feel my tires at almost every stop and if they feel "too warm" I'll get out the IR thermometer and do a quick check of the running surfaces. A few weeks ago, with OAT of about 80*F, I was seeing tread surface temps of about 150*F from a speed of 60mph. That seems a bit high to me so I'll reweigh the coach and adjust the pressures as necessary. Thanks for the articles, Roger, they are helpful to me!